1. Dress appropriately for chilly weather. The rule of thumb is to dress 20 degrees warmer than what the actual temperature is. Layer your clothing with a base layer made from a synthetic wicking material. This will keep the sweat off of your skin and keep you dry. The second layer should be an insulating material, such as microfleece or polyester fleece. This will help with wicking, but it will also keep you warm. The outer layer should consist of fabrics such as Gore-Tex or ClimaFit. This will protect you from damp conditions and keep your body heat in. 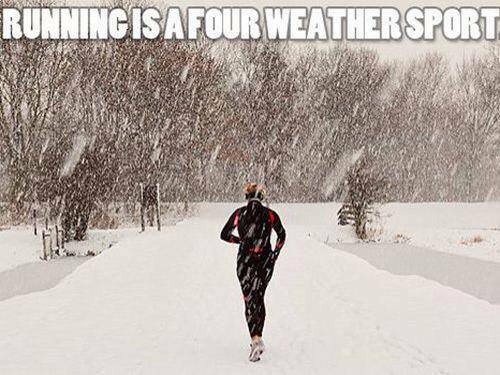 Wearing two pair of running pants/tights will keep your legs warm. Wearing tights with material like polypropolene or Thermax is perfect to wick away sweat. The outer layer should be a running pant that is wind proof. Wear shoes with as little mesh as possible to keep the cold out. Also, wearing thicker, non-cotton socks will help your feet stay dry. Lastly, always wear a hat and gloves. You can always remove these two items if you feel like you are becoming overheated. 2. Don’t get discouraged. The slippery roads and slushy pavement can be challenging. You may have to decrease your speed and dial back your normal pace. 3. For warmth and safety, plan your workout for the peak of the day. If you do run while it’s dark, be sure to run in well lit areas, know where the slippery spots are, and stay aware of automobiles. 4. Lastly, always change out of your wet clothes right after your workout to prevent hypothermia. Change into nice warm clothes, grab a warm drink, and enjoy your accomplishment of running outside. With the proper running gear, knowledge of how to stay warm, and being smart when exercising outdoors, you can beat the boredom of working out indoors during the winter. 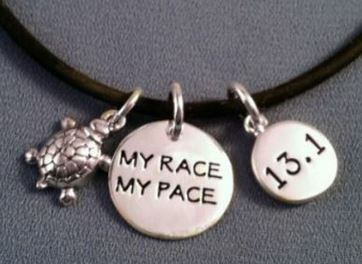 This entry was posted in Running Tips. Bookmark the permalink.